270 miles above our heads, circling the Earth once every 90 minutes is the International Space Station (ISS). This $120 billion collaboration between 16 nations has been permanently occupied since the year 2000, has travelled over 2.4 billion kilometres (1.5 billion miles) and been a temporary home to over 230 astronauts and scientists from 18 countries. The multinational crews on board ISS have performed thousands of fundamental experiments, shown us views of our own spaceship Earth with unprecedented detail and coverage, and have inspired hundreds of millions of people with their public engagement from space. Underlying this hyperbole, however, remains the fact that space-exploration is a dangerous activity. Perhaps more so than any other environment encountered by our species, Space presents uniquely hazardous characteristics, and requires extraordinarily complex vehicles for us to even visit. No surprise, therefore, that this pursuit requires unique forms of leadership. Colonel Chris Hadfield (@Cmdr_Hadfield) is an extraordinary leader, astronaut, engineer and pilot. In 1992 he was selected as a NASA mission specialist, and three years later helped build the Mir Space Station aboard the Shuttle Atlantis. His journey led him, in 2013 to become Commander of the International Space Station (ISS) where he spent six months living off the planet, infusing a sense of wonder into our collective consciousness not felt since humanity first walked on the Moon. I caught up with Commander Hadfield to discuss his leadership learnings from an incredible career in space. Q: Are leaders born or made? [Chris Hadfield] The randomness of evolution means that everyone is born with strengths and weaknesses; every human being, every dog, every tree! It’s certainly true that some people may have a predisposition to want to take some sort of leadership role whilst others don’t; but nobody is perfect at leading, or uniquely born into it. All of us are raw material, and that means we can improve and get better at leading- you often find that in extreme situations, perhaps a fire, or where someone may have a medical emergency, in those situations we find leadership skills we perhaps never knew we had. Leadership is about being willing to enact change, it means saying, ‘OK, I’m going to take responsibility for changing something…’ and that something singular, within your own life, or may be something that affects countless people. I was just a teenager when I first became interested in leadership. I realised it’s the art of influencing human behaviour to accomplish a mission in a matter desired by the leader. I was not born to become a leader by any means. Like all of us, I was born with the raw material to read and observe; and it’s almost entirely due to the training I’ve had, through observing good and bad leaders, and through making room for introspection to decide the things in my life that were worth taking a stand on, that I became a leader. We all have the capacity to lead within us, that’s the beauty of leadership; you can do this aged 8 or 88, there’s no limit. Q: How do you bring-together diverse, high performance teams around common goals? [Chris Hadfield] To bring a team together, you have to start with a common definition of success or perfection… that’s easy if you’re a bunch of people thinking the same-way; for example, you may be on a football team where you’re one goal away from winning and there’s only 5 minutes left in the match; it doesn’t take a lot of convincing for everyone to understand what needs to happen next… but most of life isn’t the last 5 minutes of a football game… most of life is complex and diverse. If you want to lead and effect change on a subject you believe in, you have to convince other people, and therefore need this common definition of what success looks like. The more diverse your team, the less aligned and organised it may be at the start, and hence the more important it is to get that vision of what the end game looks like. It’s really important to make sure that everyone on your team knows what success or achievement looks like if everything goes perfectly. Most every decision that your team will make is independent of you as a leader. Once in a while, they may update you or ask you a question, but the vast majority of decisions are made either individually, or inside teams- and if those individuals and teams don’t know what that end-game truly looks like, the odds of them making the right decision at any moment in time diminishes. As a leader, you also have to work on yourself and make sure you have all the skills necessary to make the decisions and recommendations you need to. It’s often overlooked, but it makes sense… as a leader, you have to do your homework, be competent at your role, know your strengths and weaknesses and those of your team. This last piece is important as you must be able to take advantage of strengths and try to ameliorate for weaknesses- to put it another way, give people the job that suits them, or skill them up. Relentless practice and preparation are crucial for any high-performance team. This means regular preparation, simulation and discussion around what you are trying to accomplish. Many professions have this at their core- soldiers, astronauts, firefighters, pilots- and it works, it commits behaviours, dynamics and preparedness to a state that is almost automatic. Especially in teams with diverse languages, cultures, objectives and backgrounds, you have to practice good communication and iterate regularly. You need to constantly communicate and find out how people are doing, let them know how you’re doing, find out what’s important at any given moment, understand what you don’t know, and get a view of what’s going right and wrong. For communication to be effective, it has to be open, transparent, non-judgemental and non-threatening. Also, don’t wait till the end to celebrate. There are countless opportunities to celebrate small successes between here and there, and to enjoy the process of leading a team towards a final destination. Often, leaders raise the bar of victory so high that it feels unachievable, stops people goal-setting along the way, and ultimately makes the chance of success less likely. That’s my particular recipe of how to lead complex teams and how to try and be successful in those teams. [Chris Hadfield] The role of failure depends on the purpose of your team. If you’re on a chess team, losing a match may cause disappointment for you and your team, but it will not cause a tragedy! If you’re a team of astronauts trying to dock with a space station, failure most likely means death or- at best­- significant financial and mission consequences. The higher the stakes, the more important it is to realise that failure is inevitable and so we have to anticipate it, prepare for it, minimise it, and ideally… avert it. We have to embrace failure into our practice of leadership; it is inevitable and- frankly- if everything went right, we wouldn’t need leaders! It’s important too that we look at our language around it, perhaps instead of calling it failure, it makes more sense to call it the opposite of going right, i.e. going wrong. Understanding failure means practicing when consequences are low. For example, if a fireman messes-up during a real fire, there could be loss of life. This is why they use realistic simulations to practice processes, prevent errors happening, and understand the real world more accurately. Ultimately, even if you practice a complex task dozens of times, you may not be perfect, but you will significantly increase your chances of succeeding when things go wrong. In our day to day lives this happens too. Think about heart attacks, they are a common medical emergency. There’s a chance that many of us will, at some point in our lives, come across someone having a heart-attack, but if you did…. Do you know what you would do in that situation? This is something we can all practically prepare for, perhaps with some online research, or by taking a first-aid course. In space exploration we regularly see that failure is both unavoidable, and that it is learning and process that creates success. Take the Soyuz crash of October 11 where the rocket blew-up on the way to space. It is precisely because of all the training and because of the vehicle design that all the crew were back in the arms of their families within 2 hours of the incident, without a scratch. It is precisely because of all those years of anticipating and designing for failure that they are alive today. 99.9% of the time, you are not in a burning building- and that is precisely the time to think about what you would do in that 0.1% of time when it is on fire. A lack of information and preparedness in an emergency or crisis can be the difference between carrying yourself through, and sometimes, catastrophic outcomes. Q: How do leaders deal with incomplete information? [Chris Hadfield] Leaders work with insufficient and incomplete information. Nobody ever has all the information they need to make a decision, and so your own personal competence is key; you need to have the ability to make judgement calls with incomplete information. Take the Captain of an aircraft carrier. At any given moment in time, they will not have all the information they need- but they also weren’t randomly given the job of commanding that ship. By the time they command a multi-billion-dollar aircraft carrier with so many lives on the line, they will have already had a lifetime gaining the practical, technical and academic experience to be able to make decisions when they need to; whether to change course, whether to recover aircraft, whether there is a threat. As a leader, you have to have a relentless dissatisfaction with your own levels of competence, and a relentless wish to learn and self-improve. We can all learn and score 100% on a test, but if you do that same test 6 months away from now, you will not get that score; you may have forgotten, the system will have changed, the rules may have changed, or you may have changed. No system is fixed, and the more senior you are the more important it is to be relentless in your approach to self-improvement around your technical knowledge and leadership competence. During my time on the space station, I remember an incident where we started rapidly spewing liquid ammonia out into space– we had a very limited time to make lots of decisions and to fix this before we ran out of the main coolant needed for the ship. We didn’t have enough information, and so we had to go with our hastily assembled plan, based on years of preparation and experience. Every single person on the ship was spacewalk qualified, we’d been studying systems for our entire careers and so we had the mix of understanding and small delicate skills needed to solve a major problem which was not inevitable to solve. Even with all our training, there was absolutely no guarantee of being able to fix this problem; it was not one we had ever simulated- but it was because of our training and professional preparation that we made the repair in record time. Q: How do leaders manage stress? [Chris Hadfield] A large part of emotional, and therefore internal mental stress, comes from a lack of readiness to deal with things that are coming your way. If you know a big life-event is coming, and you feel helpless, unprepared or inadequate, you will get a horrible feeling in the pit of your stomach- your knees shake, and you become overwhelmed- as a result, you become less effective, and you could even feel paralysed. It’s important to use your quiet time to constantly gain skills. Between my second and third spaceflight, I had a significant medical problem that could have easily stopped me passing my physical, and hence stopped me flying. In the run-up to the examination, my Wife and I had become quite expert in this particular type of problem, and on the day itself we had a plan. We knew that if everything was clear, we were fine, and I would be able to go to space. We also knew that if things were to come out negatively, that we had a plan – we had discussed who the first 5 people were that we would call, we discussed whether we’d move back to Canada and if so, whereabouts we’d live. The bottom line is that even if that medical had come back negative, I would not have been helpless- there are thousands of jobs I could have done, and I could have still had an equally bright future. Instead of sitting there with tears in our eyes and feeling helpless, we planned for the outcomes and so we came into the meeting feeling confident. Having a plan, feeling confident and being competent are the greatest antidotes to fear. If you’re just trying to deal with the unknown by crossing your fingers and hoping, you will be utterly helpless when a situation finally manifests. In reality, you’re rarely (if ever) completely helpless, you allow yourself to be helpless. You need to take ownership of a situation, break it down into bitesize chunks and plan accordingly. Imagine you’re about to row the Atlantic, the task may seem enormous- but if you break it down and start to think, you can make plan…. What is the first thing you need? What is the training you need to do? What do you need to learn? What do you need to understand? What is the right month to undertake your voyage? When you think of problems or challenges in this way, you can analyse, learn, skill-up and get closer to your goals. However, complex the problem, you mustn’t get overwhelmed by the challenge but instead must break it into pieces, and slowly change your, and your team’s attitude to the problem; that’s how you get everyone driving towards a successful outcome. Q: How did spaceflight change you? [Chris Hadfield] Imagine asking an Olympic sprinter whether crossing a finish line changed them; guess what, it may be enjoyable, but a lot of things happened on the way to them crossing that line. It’s the same with space flight. There’s a whole lot of training, time, and effort that goes into that mission. However, I don’t ever want to belittle the experience of living off the world for half a year and going around the planet over 2,600 times. Seeing the Earth from space gives you an unfiltered understanding of it. Until you see the Earth from this vantage point, everything you knew about the planet was based on something that someone else had told you – based on their own filtered understanding and bias. Going around the world thousands of times presents you with the depth, fragility, strength and richness of Earth; and gives you a sense of what 4.5 billion years actually means. I travelled with our Earth as it crossed the Solar System and watched as Winter and Summer swapped- it was like watching the world take one of 4.5 billion breaths. When you see the human patterns on our planet from above, you are immediately struck by the commonality of human experience and the shared nature of our existence. We had internet access on ISS, and using social media gave me direct access to millions of people. Working with my brilliant son, Evan, we created an exercise where I would ask people, through Twitter, what they wanted me to take a picture of. It wasn’t the big features of our planet, but their home towns- and the specific things that mattered to them. Irrespective of where we’re from, we all have that common feeling of being proud of where we come from. We want joy, grace, laughter, confidence, love and a better opportunity for ourselves and our children. It doesn’t matter what culture, religion or conditions you grew-up in… it doesn’t matter how much freedom or oppression you’ve experienced, that’s the same humanity we’re all searching for. Seeing the Earth from a spaceship allowed a depth of understanding to seep into me that not only made me better informed, but also eternally optimistic. Referred to as “the most famous astronaut since Neil Armstrong,” Colonel Chris Hadfield is a worldwide sensation whose video of David Bowie’s “Space Oddity” – seen by over 75 million people online — was called “possibly the most poignant version of the song ever created”, by Bowie himself. Acclaimed for making outer space accessible to millions, and for infusing a sense of wonder into our collective consciousness not felt since humanity first walked on the Moon, Colonel Hadfield continues to bring the marvels of science and space travel to everyone he encounters. In 1992, Colonel Hadfield was selected as a NASA Mission Specialist, and three years later he was aboard the Shuttle Atlantis, where he helped build the Mir space station. In 2001, on Shuttle Endeavour, Colonel Hadfield performed two spacewalks and in 2013, he became Commander of the International Space Station for six months off the planet. A heavily decorated astronaut, engineer, and pilot, Colonel Hadfield’s many awards include the Order of Canada, the Meritorious Service Cross, and the NASA Exceptional Service Medal. He was named the Top Test Pilot in both the US Air Force and the US Navy, and was inducted into Canada’s Aviation Hall of Fame. 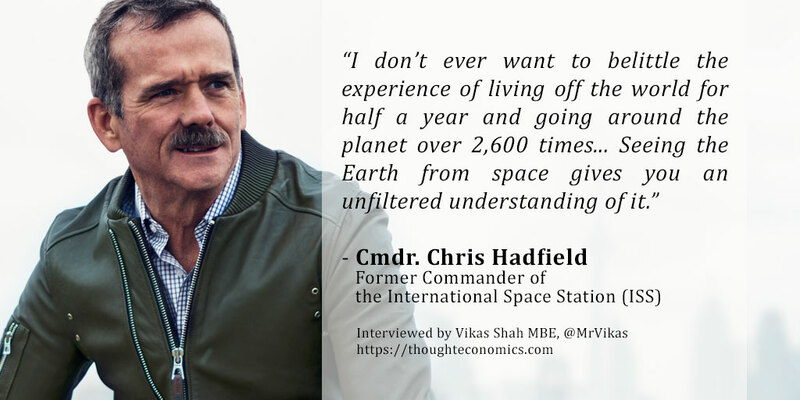 Colonel Hadfield is the author of three internationally bestselling books, An Astronaut’s Guide to Life on Earth, You Are Here, and his children’s book, The Darkest Dark. Additionally, he released his musical album, Space Sessions: Songs From a Tin Can, in 2015. He is also featured on Ted.com for his talk, What I Learned from Going Blind in Space. Currently, Colonel Hadfield can be seen as the co-creator and host of the internationally acclaimed BBC series Astronauts, and he is co-hosting, with actor Will Smith, the National Geographic series One Strange Rock, directed by Darren Aronofsky. Colonel Hadfield is also the producer of the celebrated Rare Earth series on YouTube, and the creator of the on-stage celebration Generator, which combines science, comedy, and music for sold-out audiences. Additionally, Colonel Hadfield is an Adjunct Professor at the University of Waterloo and a founding director of the Canadian Children’s Literacy Foundation, the national advocate for initiatives enabling Canada’s children to achieve their full potential through literacy and to become the most literate in the world.